Powering this Rogue is a 4-cylinder 2.5L engine with automatic transmission. The Family Tech Package makes this Rogue special by adding a 3rd row of seats, making space for 7 passengers. 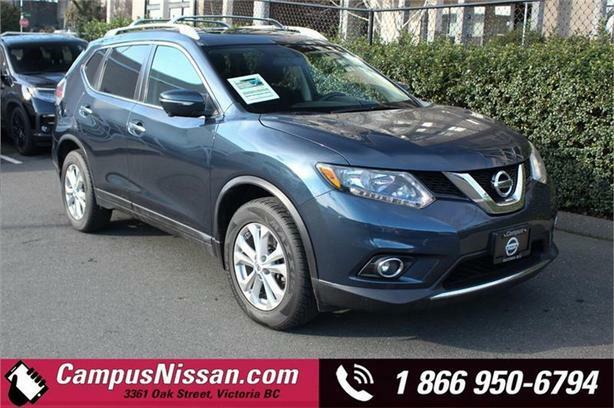 Other features equipped on this Rogue include 360 degree Around-View Camera, Panoramic Moonroof, Push-Button Start, Navigation, Remote Entry, Reverse Camera, Bluetooth, Integrated Turn Signal Mirrors, Stability & Traction Control, Fog Lights, and much more. Powertrain warranty on this Rogue remains until November 2019 or 100,000 kilometers. While every reasonable effort is made to ensure the accuracy of this data, we are not responsible for any errors or omissions contained in these pages. Price above does not include taxes or documentation fee of $495 which is applied at time of sale. Please verify any information in question with a representative of Campus Nissan.